Yesterday was World Teachers’ Day, with the theme being ‘The right to education means the right to a qualified teacher.’ The United Nations’ Education, Scientific and Cultural Organization (UNESCO) in a statement says October 5 marks the anniversary of the adoption of the 1966 International Labour Organization-UNESCO recommendation concerning the status of teachers. According to UNESCO, this recommendation sets benchmarks regarding the rights and responsibilities of teachers. It also sets standards for their initial preparation and further education, recruitment, employment, teaching and learning conditions. The recommendation concerning the status of higher-education teaching personnel was adopted in 1997 to complement the 1966 recommendation by covering teaching and research personnel in higher education. With the adoption of the Sustainable Development Goal 4 on education, and the dedicated target (SDG 4.c) recognizing teachers as key to the achievement of the Education 2030 agenda, World Teachers’ Day has become the occasion to mark progress and reflect on ways to counter the remaining challenges for the promotion of the teaching profession. UNESCO says this year’s theme was chosen to mark the 70th anniversary of the 1948 Universal Declaration of Human Rights, where education is recognized as a key fundamental right. A right that cannot be fulfilled without qualified teachers. 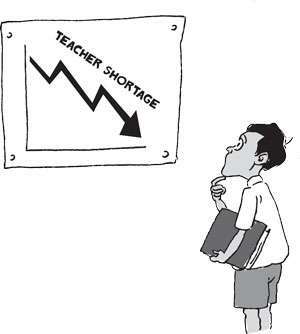 One of the main challenges is the continued shortage of teachers. There are an estimated 264 million children and youth still out of school globally, and according to the UNESCO Institute of Statistics, the world needs to recruit almost 69 million new teachers to reach the 2030 education goal of universal primary and secondary education. This ‘teacher gap’ is more pronounced among vulnerable populations, girls, children with disabilities, refugee or migrant children and poor children living in rural or remote areas. Trained and qualified teachers are fundamental to the right to education. World Teachers’ Day is co-convened in partnership with the United Nations International Children’s Fund (UNICEF), the United Nations Development Programme (UNDP), the ILO and Education International. These UN organizations say as we celebrate, the teacher’s important contributions to improving the lives of children and youth around the world, they reaffirm their commitment to increasing the global supply of qualified teachers. They have urged all governments and the international community to join them in this endeavour, so that all children and young people, no matter their circumstances, can secure their right to quality education and a better future. In Sri Lanka, the coalition government has made a significant budgetary allocation for education but the lack of qualified teachers and principals in addition to the curse of excessive tuition are also a major problem. Party politics appears to be one of the main reasons for this. Recently, the Education Ministry appointed hundreds of new teachers and principals but the appointments were suspended by the President following protest that party politics was involved. The government is also working on the vision of making the nearest school the best school. While some progress has been made, reaching this ideal situation, may take years because it involves a changing parents’ mindset that the big national schools are the best schools. Sometimes parents cheat by changing addresses or by giving huge bribes or donations, perhaps not realizing they are teaching their children, that it is not wrong, to give bribes in the form of donations or to change addresses. The children are not taught the important life’s lesson that it is better to fail than to cheat. Another important step taken by the government is to ensure that all children have at least 13 years of education. Even if they fail at the general certificate of education (ordinary level examination) they could proceed to higher education by opting for one or more of about twenty vocational training subjects offered at the higher education level. High technology is one of the areas open to them. Thereby they could get productive jobs with high salaries. This is a part of the government’s plan to build a just, peaceful and all inclusive society and we hope party politicians will not sabotage this mission to bring about multi-racial and multi-religious unity in diversity.